The University of Toledo has selected a new provider for the Student Health Insurance Plan. Payer Fusion LLC will manage the spring 2019 Student Health Insurance Plan available to undergraduate and graduate students. UT and the company entered into an agreement Dec. 31. “We are excited about this new partnership and believe it will be positive for our students,” said Dr. Phillip “Flapp” Cockrell, vice president for student affairs. Enrollment for spring 2019 through the UT Student Health Insurance Plan managed by the new provider, Payer Fusion LLC, is available for coverage that begins Jan. 1. Students can complete the enrollment forms available at utoledo.edu/studentaffairs/student-advocacy/student-health-insurance. The voluntary enrollment period will be Jan. 1 through Jan. 31. Payer Fusion LLC will send a temporary insurance card to students via email. Once enrolled, students will be able to utilize those services at the start of the new year. Those who enroll after Jan. 1 will be backdated to have the coverage beginning Jan. 1. The costs and coverage for spring 2019 are expected to match the costs and coverage for the fall 2018 semester. Aetna will be the network provider for UT. In addition, the new contract with Payer Fusion LLC will include a patient advocacy program in which students with past claim concerns can call 1.866.752.8881 or email studentstoledo@payerfusion.com for help working through any past concerns. Students with specific questions about their personal health insurance claims should contact Tonya Tressler, student insurance management representative, at 419.530.3474 for assistance. Students who are required to have health insurance and were enrolled in the Student Health Insurance Plan for fall 2018 will be automatically enrolled for spring 2019. Students who are required to have health insurance coverage can continue to waive that coverage through Jan. 31, 2019, via the myUT portal. “We are pleased to be able to continue to offer students the opportunity to voluntarily enroll in a UT Student Health Insurance Plan and appreciate your patience through this transition,” Cockrell said. Toledo (12-1) turned in a dominant defensive performance on Saturday afternoon en route to its 10th straight victory, a convincing 77-45 triumph over Penn (10-3) in Savage Arena. The victory came against a Quaker squad that had posted wins over defending NCAA champion Villanova and Miami (Fla.) earlier this season. Penn’s 45 points were the fewest by a Rocket opponent since a 59-44 win over Eastern Michigan in the 2014 Mid-American Conference Tournament semifinals. In addition, Toledo limited the Quakers to a 30.5 field-goal percentage, the lowest by a UT opponent since Miami (Ohio) shot 30.4 percent on Feb. 13, 2016. Seniors Jaelan Sanford and Nate Navigato paced a balanced attack with 15 and 14 points, respectively. Sophomore Marreon Jackson also scored in double digits for the fourth time in five games, finishing with 12 points and a team-high three steals. Junior Willie Jackson tied his career high with 16 rebounds to go along with eight points. He teamed with junior Luke Knapke (9 points, season-high 10 rebounds) and freshman AJ Edu (6 points, 7 rebounds) to help the Rockets own a 45-35 advantage on the glass. Knapke and Edu also dominated the paint defensively with four and two blocked shots, respectively. Junior AJ Brodeur led Penn with a game-high 19 points. Toledo will begin league play Friday, Jan. 4, with a nationally televised matchup vs. West Division rival Ball State (9-4) in Savage Arena. Tipoff time for the contest will be 7 p.m. on the CBS Sports Network. For tickets, go to the Toledo Rockets website, call 419.530.GOLD (4653), or stop by the UT Athletic Ticket Office in Savage Arena. UT employees and retirees may purchase tickets at half-price; UT students are admitted free with ID. Toledo (8-3) appears at No. 10 in this week’s espnW’s Mid-Major Rankings released Wednesday evening, according to Graham Hays. The Rockets are one of four Mid-American Conference schools to show up in this week’s poll, along with No. 2 Central Michigan (8-2), No. 5 Ohio (10-0) and No. 6 Buffalo (8-3). 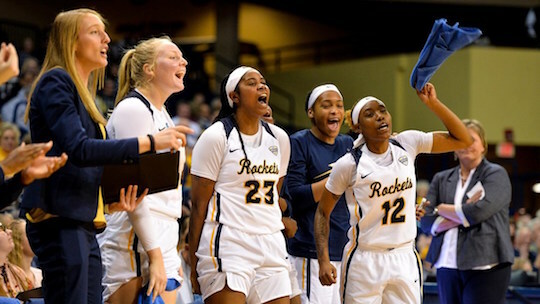 The Rockets are one of four MAC schools to appear in this week’s two mid-major polls. UT also finds itself at No. 24 in the collegeinsider.com Mid-Major Top 25 Poll. Toledo has begun the season winning at least eight of its first 11 games for the third-straight year and 15th time in program history. UT recorded its eighth non-conference win with a 77-60 home triumph against Detroit Mercy Dec. 21, tied for sixth most in school annals before league play starts. The program record is 12 victories prior to the start of MAC play in 2012-13, followed by 10 wins in 2009-10 and nine in 1989-90 and 2016-17. The Rockets return to action Sunday, Dec. 30, when they host NCAA Division II member Tiffin (2-8) in an exhibition game. The opening tip against the Dragons is slated for 2 p.m. in Savage Arena. The exhibition matchup is free to attend, and the Grogan Room will be open to all fans. 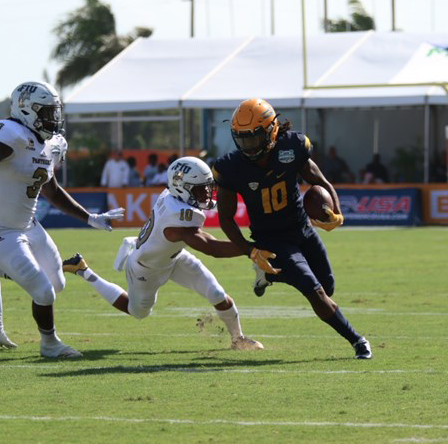 Toledo scored the game’s first points in the first 29 seconds of the Makers Wanted Bahamas Bowl, but couldn’t hold off Florida International University, falling to the Golden Panthers on Friday afternoon. Eli Peters threw for 264 yards and tied a career high with three TD passes. Diontae Johnson caught six passes for 98 yards and a score, while Jon’Vea Johnson added two touchdown catches. Bryant Koback scored the game’s first touchdown with a three-yard rush in the first quarter, and both Richard Olekanma and Tuzar Skipper led the Rockets with eight tackles. Junior wide receiver Desmond Phillips and the Rockets fell to Florida International University, 35-32, in the Makers Wanted Bahamas Bowl. Toledo took the lead early with 10 points in the first quarter, but FIU’s strong rushing attack put the Panthers ahead by 10, 35-25, late in the game. However, Peters found Johnson for the second time in the corner of the end zone for a 43-yard touchdown with two seconds left to keep the Rockets’ hopes alive. UT’s chances came down to an onside kick, which was recovered by FIU to seal the Panthers’ victory. Toledo set the tone on the opening kickoff, as freshman Terrance Taylor forced an FIU fumble that was recovered by junior DeDarallo Blue on the FIU three-yard line. After an incomplete pass, Koback ran it in for a three-yard TD that put Toledo up 7-0 just 29 seconds into the contest. Near the end of the quarter, a Rocket drive stalled at the FIU 10-yard line, causing UT to settle for a 28-yard field goal by Jameson Vest to extend the lead to 10-0. In the second quarter, FIU got on the board on a five-yard touchdown run by Anthony Jones that capped an eight-play, 75-yard drive to trim the lead to 10-7 with 12:44 to play in the half. Toledo missed a chance to put more points on the board when Koback fumbled on the FIU three-yard line following a four-yard gain. The Panthers recovered on their own four-yard line. FIU took a 14-10 lead on a 36-yard pass from Christian Alexander to tight end Sterling Palmer with 2:57 left in the second quarter. Toledo regained the lead on its first drive in the third quarter, moving 75 yards in eight plays. Peters scrambled for 28 yards to the FIU 10-yard line, then finished off the drive with a seven-yard TD toss to Jon’Vea Johnson. FIU came right back, however, scoring on a 30-yard touchdown run by Anthony Jones to give the Panthers a 21-17 edge with 3:47 left in the quarter. The Golden Panthers added to its lead early in the fourth quarter when Maurice Alexander raced 16 yards up the middle for the score, capping a nine-play drive that began on the FIU’s 12-yard line. Toledo answered with a two-yard TD from Peters to Diontae Johnson. UT made the two-point conversion on a nifty catch by Cody Thompson in the back of the end zone to cut the lead to 28-25 with 7:21 left. FIU’s Jones scored his third rushing touchdown of the game late in the fourth quarter, putting the Rockets in a 10-point hole with 41 seconds left. The Rockets did not go quietly, though; Peters found Jon’Vea Johnson for a 43-yard TD in the corner of the end zone to pull Toledo within three, 35-32, with just two seconds remaining. However, UT’s onside kick attempt was not successful. Altmetric, a data company that tracks and tallies the year’s 100 most attention-grabbing studies, chose UT’s blue light research as No. 76 in its annual list that provides a picture of the influence and reach of academic work. 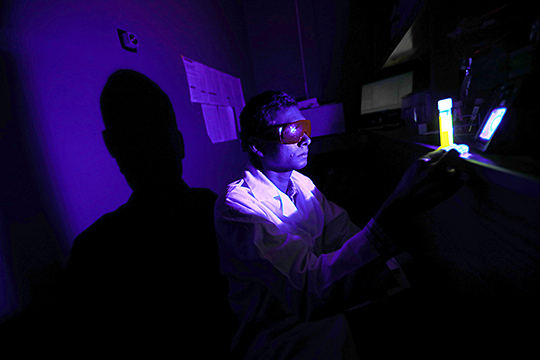 Dr. Ajith Karunarathne, assistant professor in the UT Department of Chemistry and Biochemistry, earned international attention in August for discovering how blue light triggers cell death in the presence of retinal, a light harvesting molecule in the eye. His research about blue light-induced cell damage reached more than 400 million people around the world through hundreds of news outlets, including Popular Science, USA Today, CNN Headline News/HLN, The Guardian, Teen Vogue, Forbes and Newsweek. Altmetric not only tracks news media mentions, but also social media shares and policy documents. Overall, the company tracked more than 25 million mentions of 2.8 million research outputs in 2018. In its demographic breakdown of the blue light research, Altmetric shows that while scientists and physicians shared UT’s news on Twitter, most of the tweets — 84 percent — came from members of the public. In this case, UT chemists explored how the combination of blue light and retinal — the abundant chromophore in the eye — damages cells. After his research showing retinal-generated toxicity by blue light was published in the journal Scientific Reports in July, Karunarathne said he received feedback from people who shared their experiences on how occupational blue light exposure is a major health concern for them. Karunarathne’s lab currently is measuring light coming from television, cell phone and tablet screens to get a better understanding of how the cells derived from the eye respond to everyday blue light exposure. “We are looking into the details of the discovered mechanism and investigating if commonly used light-emitting devices have the potential to trigger toxic chemical reactions in cells,” Karunarathne said. The Toledo Rockets held their final practice Thursday in preparation for their game vs. Florida International University at the Makers Wanted Bahamas Bowl Friday, Dec. 21. The game will be televised at 12:30 p.m. on ESPN. Later Thursday evening, the Toledo band and cheerleaders fired up Rocket fans visiting the island with a pep rally at the Dolphin Cay Lawn at the Atlantis resort where the team is staying. The UT chearleaders led a pep rally Thursday night in Nassau. Head Football Coach Jason Candle said the trip has been a special one for the team. Throughout the week, players have commented on the amazing weather and the beautiful Atlantis resort, as well as the native food. But Friday, all the focus will be on the game and the Rockets’ opponent. “They’re a really fast, explosive offense. We have to do a good job of making them uncomfortable and shutting down the run. If we do that, we’ll have a good chance,” said Rocket senior linebacker Richard Olekanma. The U.S. Department of Education’s Drug-Free Schools and Campuses Regulations require institutions of higher education to review their alcohol and other drug (AOD) programs and policies every two years. 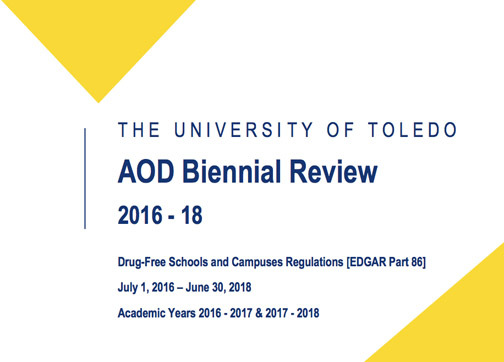 As such, The University of Toledo prepares a review biennially in accordance with federal guidelines. Read the review for academic years 2016–18. The review includes information related to programming, assessment, policies and recommendations for revising prevention efforts in order to meet the requirements of the 1989 amendments to the Drug-Free Schools and Campuses Act, as stated in Part 86 of the regulations. “The review is yet one additional means to help ensure our students, faculty and staff have a safe and healthy environment on all UT campuses,” Cutri said. 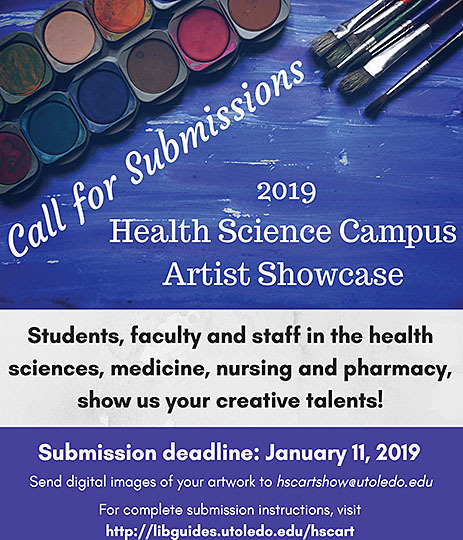 Mulford Library is seeking submissions for its 2019 Health Science Campus Artist Showcase. The deadline to apply for consideration to be included in the annual event is 5 p.m. Friday, Jan. 11. The library is accepting submissions from UT faculty, staff and students in the health sciences — nursing, medicine, pharmacy and the health professions — as well as UT Medical Center employees. To be considered for the show, digital images of artwork can be sent to hscartshow@utoledo.edu, along with a submission form that can be found with guidelines on University Libraries’ website. Artists will be notified if their submitted pieces have been accepted no later than Wednesday, Jan. 16, and will receive instructions for bringing in their artwork to the library for the showcase. The showcase will be on display from Feb. 18 through April 10 on the fourth floor of Mulford Library. In the past, artwork included photography, painting, drawing, sculpture, jewelry making, quilting, multimedia, graphics, wood carving and more. An opening reception featuring a talk by Dr. Paul H. Brand, associate professor emeritus of physiology and pharmacology, and accomplished artist, will be held Friday, Feb. 22, at 4 p.m. in Mulford Library. Questions about the showcase can be directed to Jodi Jameson, assistant professor and nursing librarian at Mulford Library, who is a member of the artist showcase committee, at 419.383.5152 or jodi.jameson@utoledo.edu. 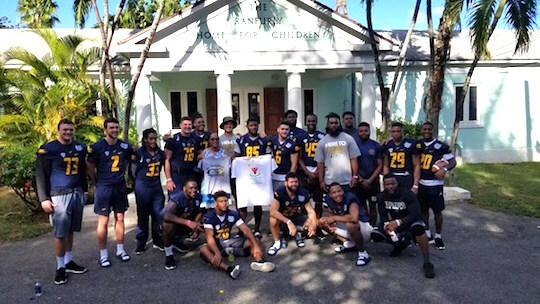 It was another busy day for the Toledo Rockets, who completed a brief morning practice Wednesday in preparation for Friday’s game vs. FIU at the Makers Wanted Bahamas Bowl, then took some time out in the afternoon to meet with area youth in the Nassau area. UT will play the Golden Panthers Dec. 21 at 12:30 p.m.; the game will be televised on ESPN. The Rockets had a one-hour workout at a practice field adjacent to Robinson Stadium, where the bowl game will be played. In the afternoon, some players spent some free time while others met with area youth. One group of players met with youngsters at the Ranfurly Home for Children, a refuge for children who are in the foster care system. Another group of players participated in a youth football clinic at Robinson Stadium, where the Makers Wanted Bahamas Bowl will be played. Toledo will have its final practice Thursday. Afterward, Head Coach Jason Candle and selected players will participate in a news conference at Robinson Stadium. Later on Thursday, the Toledo cheerleaders and band will lead a pep rally at the Dolphin Cay Lawn at the Atlantis resort where the team is staying. The University of Toledo will move to a new provider for the UT Student Health Insurance Plan. UT was informed Dec. 10 by the company that manages its current plan — Student Educational Benefits Trust (SEBT) — that it will close its operations at the end of the year. The University is working in collaboration with SEBT leadership to select a new insurance provider. The goal is to be able to provide undergraduate and graduate students an affordable and quality health insurance plan and to develop a transition plan that causes the least disruption to the students, said Dr. Sammy Spann, associate vice president and dean of students. The University is in negotiations for a new student health insurance plan provider and will select a new provider on or before Friday, Dec. 21. Once a new provider is selected, students will be notified via email. Students who have insurance coverage for fall 2018 will continue to be covered for the remainder of the calendar year. They are asked to keep using their health insurance card until a new insurance provider is identified by the University. The students who are required by the University to carry health insurance — which includes student-athletes, international students who hold a J1 visa, and students in select majors (primarily in the medical fields) — can waive their coverage with proof of other coverage now through Jan. 31 via the myUT portal. Once the new provider is selected this week, the insurance portal for voluntary enrollment will reopen and students will be notified via email. All undergraduate and graduate students are eligible to voluntarily enroll in the Student Health Insurance Plan through The University of Toledo. Students with outstanding claims with the SEBT provided Student Health Insurance Plan predating Aug. 10 can send copies via email to studenthealthinsurance@utoledo.edu or via fax to 419. 530.3418. If students have specific questions about their claims, they can contact Tonya Tressler, student insurance management representative, at 419.530.3474.